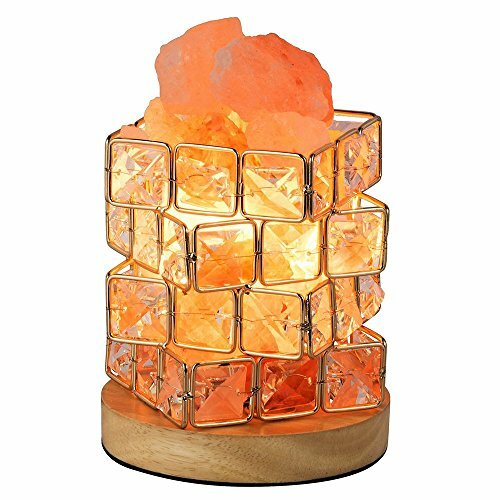 Ingeniously cube designed with elegant wooden base, HALOViE Himalayan Salt Lamp will blend into any home decor nicely while creating a soothing ambiance. Whether is in bedroom or in your office, the salt crystal lamp provides a warm and peaceful glow and benefits your health! How to use the salt lamp? 4. Rotating the dimmer switch to adjust the lightness of the bulb. HIMALAYAN LAMPS SET GIFT PACKAGE - Unique Salt Lamp- The lamps are handmade and hand carved in the Himalayan Mountains, Include salt lamp,nightlight,candle holders,bath salt,all of these made by 100% Pakistan Himalayan crystal salt. Birthday gift, Valentine's Day gift, Mother's day gift, Father's gift, Romance & Love, it is your perfect choice as decorations & gifts under 40 for Christmas, Valentine's Day, holidays, birthdays, graduations, thank-yous, and special occasions. HOME DECOR - We've housed This in a decorative wood base, perfect for the design-conscious home. It will fit right anywhere, at the center of a coffee table, bedside table, Dining or living room. Great for meditation, yoga spaces, and as a night light. Also, you can try it as a bedside lamp. Illuminate your room with a warm, pleasant & relaxing amber glow. NATURAL LIGHTING AND AIR PURIFIER - Enjoy the incandescent and natural properties of these unique salt crystal lamps. Himalayan salt lamps provide a pure and natural source of light. The timeless natural shape of this Himalayan lamp When lit emits a soft amber glow, the heated Salt Crystal emits negative ions the naturally ionized air Creates a Soothing and Calming Affect which helps you sleep better at night, allowing you to wake refreshed. If you have any questions about this product by HALOViE, contact us by completing and submitting the form below. If you are looking for a specif part number, please include it with your message.